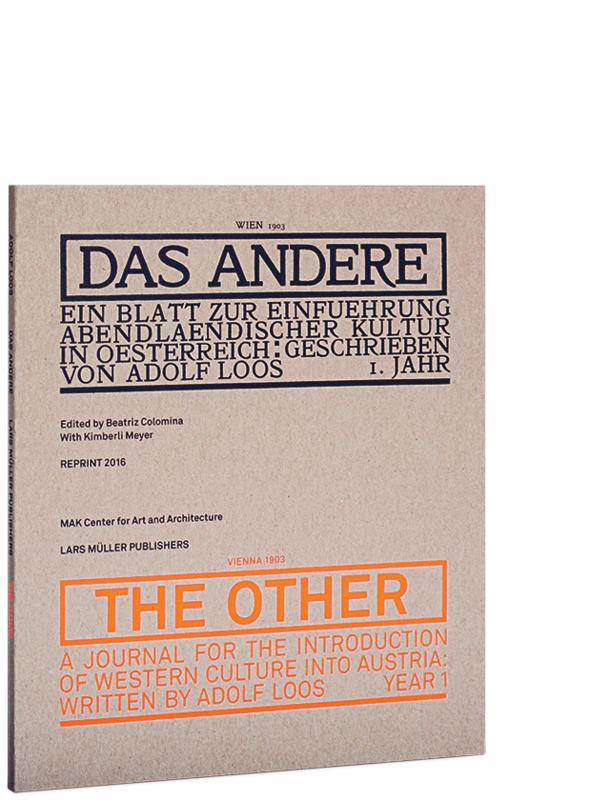 In 1903, Adolf Loos, onxe of the sharpest and most influential architects and critics of the twentieth century, edited the astonishing journal Das Andere (The Other), subtitled A Journal for the Introduction of Western Culture into Austria. Only two issues were published of what is today considered one of the most important documents of modernity – a radical, at times shocking statement in which nothing was off limits, from fashion to masturbation. The journal, a manual for modern life, was entirely written by Loos and born out of his aversion to the hypocrisy and superficial aestheticization of life in Austria, which he saw embodied by the Secession movement and the Wiener Werkstätte. As a counterbalance, Das Andere proclaimed Loos’s admiration for the fashion and culture of England and America. He scrutinizes every element of contemporary life with an acerbic wit. This facsimile edition allows today’s readers to discover Loos’s little magazine anew, which takes us directly to the heart of his polemical position. It is accompanied by a commentary and the English translation. Beatriz Colomina supplements the facsimile with an extensive critical introduction.